80-Place Tube Racks. Fraction collector plate style. 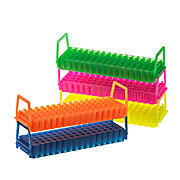 Versatile & efficient storage in bright, fluorescent colors. 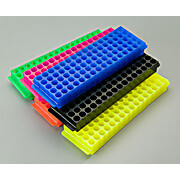 Holds tubes up to 2 mL, 11 x 26mm maximum. Rack dimensions: 226 x 67 x 28mm. Container dimensions: 236 x 85 x 52mm.